Sorry, there are no shows on sale at Noel Coward Theatre right now. The NoÙl Coward Theatre, formerly known as the Albery Theatre, is a West End theatre on St. Martin's Lane in the City of Westminster, London. It opened on 12 March 1903 as the New Theatre and was built by Sir Charles Wyndham behind Wyndham's Theatre which was completed in 1899. The building was designed by architect W. G. R. Sprague with an exterior in the classical style and an interior in the Rococo style. In 1973 it was renamed the Albery Theatre in tribute to the late Sir Bronson Albery who had presided as its manager for many years. Since September 2005, the theatre has been owned by Delfont-Mackintosh Ltd. 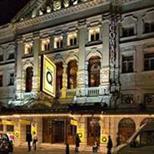 It underwent major refurbishment in 2006, and was renamed the NoÙl Coward Theatre when it re-opened for the London premiere of Avenue Q on 1 June 2006. NoÙl Coward, one of Britain's greatest playwrights and actors, appeared in his own play, I'll Leave It To You, at the then New Theatre in 1920, the first West End production of one of his plays. The theatre seats 872 patrons on four levels. The building is now a Grade II Listed structure. It is one of the 40 theatres featured in the 2012 DVD documentary series Great West End Theatres, presented by Donald Sinden. The Noel Coward Theatre is just around the corner from Leicester Square tube station, served by the Northern and Piccadilly lines. Piccadilly Circus tube station is five minute walk away through Leicester Square and is served by the Piccadilly and Bakerloo lines. All major London stations connect to the tube. The venue is in central London so it is advised that you use public transport. Buses 24, 29 and 176. If you have to drive, there are car parks at MasterPark in China Town and Trafalgar Square. Also NCP at Upper St Martin's Lane. There are limited wheelchair spaces in the theatre. Please contact them for more information on 0844 482 5141. The venue has infa-red headsetd in the box office that require a deposit. Please contact the venue for more information. Dogs are not generally allowed inside the auditorium, they can be looked after by the theatre staff during performance times. Please contact the venue to arrange. For all access information please call the venue on 0844 482 5141.